Throughout his filmography, Bong Joon-ho has frequently engaged with and remained critical of globalisation. More specifically, his fascination with its effect on local spaces - with which he has a personal connection through his home nation’s historically torrid relationship with America - usually manifests in examinations of movement. In Memories of Murder (2003), he used the template of a police procedural to analyse how a Korean style of detecting, taking its cues from folklore and rurality while emphasising physically laborious movement, was no match for the efficient American mode that had been propagated by various media for decades. In The Host (2006), he confronted the American-patented &apos;monster movie&apos; by recalibrating the visual emphasis onto the humans, or rather with them - the running, screaming, terrified civilians caught in the monster’s wake - as well as assessing how the local surroundings were affected by and responded to the threat. Finally, in Snowpiercer (2013), his English-language debut, the trappings and signposts of a Hollywood dystopian action blockbuster were first considered and then dismantled as the protagonist’s physical movement from the tail section to the engine of the titular train signified his ideological reawakening - and resulted in his toppling from the narrative by the only two Korean characters, who recognised the hypocrisy of his revolution long before he did. With his most recent film, Okja (2017), he continues to build on these ideas and to meditate on his home country’s complex correspondence with globalisation as an impending development. Once again, there is a focus on the comparative locality of South Korea in conjunction with the pervasiveness of a global corporate entity, and the movement between these spaces is part of what this article aims to examine. In addition, the film’s handling of images as an integral aspect of a corporation’s functionality, in terms of their construction, distribution, and perpetuation, will be investigated in relation to what constitutes authenticity in a globalised, digitised world - themes undoubtedly timely (and ripe for exploration in a film that was produced exclusively for Netflix). Through close textual analysis, I will attempt to elucidate how a film about a genetically modified super-pig navigates a globalised world perturbed by images that lack truth and authenticity, altogether making the argument that the eponymous animal’s innocence and friendship with her owner, Mija (Ahn Seo-hyun), provide the only images of truth and purity in which we, the audience, can fully trust. The film opens with a barrage of visual information that melds newspaper headlines, animated slides, and a spotlit, heavily made-up, all-in-white Tilda Swinton, placing immediate accentuation onto artifice and construction. In a style that seems largely indebted to the promotional advertisements that precede Youtube videos, we are introduced to the Mirando Corporation and their newly appointed CEO Lucy (Swinton). The high-contrast between her blindingly pale dress/hair combination and the perfectly cobwebbed dankness of what we are informed is her grandfather’s old warehouse brings slightly too much attention to its own overtness and tasteless deployment as a nostalgic device. While she waxes lyrical about the company’s history, and affirms its “new core values: environment and life. Awesome!” the desire to appear sincere, well meaning, and ethically elegant comes across as an over-calculated effort to project an ethos and desirable image for the company. The overplaying of the opening, in truly Juvenalian fashion, alludes to the attempts by corporations to appear down-to-earth and relatable, which are frequently so transparent and motivated that they often do the satirists’ work themselves. See also: Corporate Memes. It is precisely these attempted methods of controlling public perception that the film continues to scrutinise, and there is certainly something to be said for a film premiering on Netflix engaging with the ease with which companies can distribute digital images. The images and ideas also gloss over a rather dark and unsettling reality. So lovingly delivered by Swinton, and animated with such playful colour and verve is the admission that the Mirando Corporation have secretly been producing genetically modified super-piglets in their quest to solve world hunger, that the worrying moral and ethical implications seem totally lost on the enraptured live audience. You might recall a similar instance in The Lego Movie (2014) that finds the film’s evil corporate mastermind, President Business, broadcast a statement: “let’s all take extra care to follow the instructions…or you’ll be put to sleep” - before following up with a reminder that “Taco Tuesday” is fast approaching. Bong’s film is less playful in this regard, but still indulges in more conventionally \"evil\" constructs by briefly cutting away from Lucy Mirando’s President Business impersonation to Frank Dawson (Giancarlo Esposito), a leading Mirando associate, waiting and watching in the darkness of the wings. The rapid change in the mise-en-scène - namely the texture and lighting - from the eye-popping animation to the rust and grub of the warehouse’s viscera, suggests something sinister lurking beneath the colourful surface. Esposito’s character merely stands and watches, nodding along to Lucy’s obviously rehearsed monologue, but his presence and visual eeriness remind us first and foremost that the monologue is just that - rehearsed - and with good purpose. In what is already a baffling scene that features a character suffer the punishment of having his arm frozen beyond repair with a shoe balancing on his head, this moment of magnification forms the apex, and confidently embeds the image deep within our consciousness. Later in the film, it is revealed to be the same hand movement made by the children who are forced to work in the engine of the train itself. It draws on notions of human labour’s conflation with mechanics and technology in the twentieth century - an idea with traceable roots in modernism, and the German Expressionist art movement, for example. For the audience of Okja, the reappearance of Tilda Swinton’s sharp and gangly hand in another distinctive pose that is so clearly signposted once again becomes far more akin to a citation than a coincidence. As well as foreshadowing later moments, the hand movements in Snowpiercer further illustrate Mason’s speech’s focus on the predetermination of social status, and the immobility that comes with it. She is reminding the occupants of the tail section that it is their place, and that they are locked within these confines indefinitely - the rigid and bony clasp of her fingers resembles a rusty old key twisting in its keyhole. In Okja, the movement of her fingers is slightly less mechanical; they tap up and down, one-by-one, as if playing an invisible piano. The dialogue they illustrate describes Mirando’s global distribution of the super-pigs, and boasts their coverage of 26 countries. If we view this in binary terms with the similar instance in Snowpiercer, we find the gesture reflecting both the varying degrees of social mobility in a modern industrial setting, and the relationship between manual labour and the disembodied corporate activity of which Lucy Mirando is representative. Mason is reminding the lowest of classes forming the train’s majority that their capacity to move is restricted to and symbolised by their architectural surroundings - the tail section of a train. For the diegetic audience witnessing the presentation in Okja, the image of her hand drifting across the globe thematically conveys the freedom and control of movement awarded to multinational corporations in such an economic climate. She is demonstrating the dispersal of the genetically modified pigs in a manner that associates the Mirando Corporation’s global reach and power. The forms and levels of movement, governed by a process like globalisation, are purveyed and controlled by images. This is built on and developed throughout the film. The mise-en-scène especially continues in the vein of artifice established by the prologue. The interiors of the Mirando headquarters, for instance, are an excessively sparse and hyper-clean, minimalistic, oddly digitised architectural arrangement. The use of giant glass doors invites the cinematography to capture the reflections of lights, computers, and the Mirando logo. When Mija visits the premises, she is rather inextricably instructed by the lone receptionist to speak to her on the phone instead of conversing face to face. They are the only two people present in such an open space, and yet their separation by a wall of glass dictates that they communicate electronically. Immediately Mirando are depicted as imagistic and inauthentic. This is played for comedy when a decorative tree is pushed over by Mija and revealed to be electronic, its wires and innards popping and fizzing. Such extremes are taken in order to maintain total control over the images they perpetuate, and to realise their own self-image as a company, that Bong frequently undermines them for comedic purposes. Following on from Mija’s encounter with the receptionist, she witnesses some Mirando officials escorting Okja into a van while ordering that no footage or photos will be taken, to prevent the risk of their inhumane treatment being broadcasted on social media. Only once Okja is safely inside does the representative pose for a selfie and subsequently upload the harmonious moment - totally in control of what images are circulated. However, as with the cheesy smile that punctuates the representative’s super-pig selfie, and the sheer plasticity and grotesque cutesiness of Swinton in the opening, the images are exposed as transparent and inauthentic by the film’s perspective and construction. Perhaps the film’s least subtle satirical resource is its characterisation of Dr Johnny Wilcox (Jake Gyllenhaal), “TV’s most beloved zoologist and veterinarian, and the new face of the Miranda Corporation.” He is constantly presented to us as a flurry of awkward contradictions and cartoonish exaggerations, achieved primarily through Gyllenhaal’s fearless performance and the elaborate costume design by second-time Bong collaborators Choi Se-yeon (Mother, 2009) and Catherine George (Snowpiercer). It is vital to this discussion and to the film’s construction of Dr Johnny that he is first introduced to us in a private context. We know, from the opening presentation, that he is a popular television figure and considered an “expert” in his field. When he is then seen, for the first time proper in the film, struggling up the hill to meet with Mija and her grandfather in a sweat-drenched shirt - he opens their fridge for water without invitation and recoils in disgust, before complaining that all the other super-pigs were accessible on flatter land. The impression given, it is fair to say, is not exactly that of a nature-loving animal expert. Rather, the image of a man sent to do the duty his job dictates, and to keep up appearances as the face of a company, comes across more clearly. Such an ostensibly throwaway line instead serves to encapsulate the film’s overall attitude towards the characters employed by the Mirando Corporation. Dr Johnny, as we are told early on, is the newly appointed face of the company, and in this scene, we find him to be just that - the face of a company. After the instructions to film him are given, we cut to a longer shot, allowing us the pleasure of witnessing Gyllenhaal’s gifted command of gesture as he changes costume and prepares to be on air. He hunches away and rips off his sweaty shirt rather disgustedly, immediately rebuking any semblance of emotion he appeared to show earlier. He hurriedly pulls on a Mirando-branded t-shirt, and snatches his patented jungle hat from one of his colleagues. The real treat, however, occurs when he then turns to face the camera, and allows a rather patronising, but no-doubt more comfortable and deftly easy smile to spread underneath his moustache. The skilled handling of the transition by Gyllenhaal details for us Dr Johnny slipping into his natural environment - not out in the wild or amongst nature, but in front of a camera. The transition completes itself when he opens his mouth to speak, and somehow musters an unprecedented deepness in pitch and tone of voice: he is now in TV mode. Shooting the scene in this manner exhibits genuine methodical tact, in first acquainting us with him at a moment when he is stripped down to his true, authentic self - reaching the end of a laborious climb in the sweltering heat of rural South Korea - before expounding his metamorphosis into the trusted TV personality that he has so well cultivated. This expose of his overtly constructed image and television persona is further satirised in a company meeting scene, where he wanders in wearing a hideous yellow flower shirt, underneath a cream blazer, and coupled with denim shorts and knee-high black socks. It captures a sense of confusion in his image. He regularly declares that he is the face of the company - a multi-national corporation - and yet he is renowned for being a jungle-dwelling animal lover. In this wardrobe disaster, his outfit appears to be an attempt to rectify the discrepancy and conflate two image types into one; he is combining the smartness of office wear with clothes suitable for hiking. For someone part of a rhetoric that frequently over-concerns itself with how things will look, this instance provides a boiling point where their previously strict command over images is beginning to be compromised - not least by the film’s own penetrating gaze. The power of a singular image is most saliently ruminated on when the narrative comes full circle and the Mirando Corporation are threatened with having the captured footage of Okja’s mistreatment, and other evidence of their brutality behind the scenes, exposed and circulated with the aid of Youtube. Lucy Mirando, upon realising, spells the thesis out: “That’s the image that’ll kill us. Right there. That image.” With the carpet swept from underneath their feet, the film’s obsession with undermining their blatant inauthenticity and cringeworthy corporate fakeness pays itself off by having them essentially beaten at their own game. As a counterpoint, both the locality of rural Korea and Mija’s relationship with Okja are immediately posited as authentic, and in many ways the antithesis of the Mirando Corporation. Following Lucy Mirando’s ghastly overture, the assault on the senses is remedied by cutting firstly from her final words (her position against a backdrop of an animated tree is noteworthy here) to Bong’s directorial credit, before the soundtrack fades out and the picture fades in to reveal the film’s titlecard, in harmony with a stunningly serene, mountainous landscape. On a purely cognitive basis, the association of the word ‘Okja’ with the image of nature confirms the eponymous animal’s true environment; it instantly disregards Mirando’s declaration that she was conceived in a laboratory for a predetermined purpose. The image holds the screen for its fair share of seconds; enough, perhaps, to qualify as an Ozu-esque pillow shot, guiding us comfortingly into this comparably utopic setting. The series of moments that follow have rightfully drawn comparisons to a fairy tale, and in particular the films of Hayao Miyazaki in their examination of the central relationship. The first shot of Mija finds her calmly blowing a dandelion, watching in child-like awe as the seeds disperse around the frame. The text on screen reads “10 years later…far from New York” - something the audience could have guessed themselves, yet the conscious announcement declaring the setting as antithetic to The Big Apple works specifically to set up the binary relationship the film seeks to investigate. While blowing on the flower, a ruffle in the leaves behind announces the arrival of Okja herself, who snuggles up to her lovingly and expresses some mild discomfort. Mija acknowledges the grievance and lifts up her giant foot, tenderly removing a spiky pinecone of sorts. It beautifully encapsulates what their relationship is founded on: mutual trust, care, and understanding. 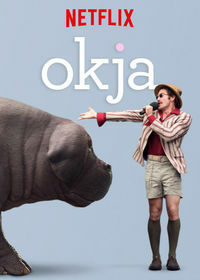 In conjunction with the high-speed, data-driven, digitally-obsessed, globalised environment that we are first introduced to, the scenes that establish Mija and Okja’s everyday life of exploring the landscape freely and living with her grandfather up in the mountains work to code their existence as deeply local, and even folkloric. The frequent use of long shots that dwarf them by their surroundings emphasise the sheer amount of space they have in which to move, and the fact that not a single other human is seen or spoken to accentuates the quietness that globalisation makes so impossible. That disconnect from the rest of the world, which is here presented as a positive, is something Bong engaged with in Memories of Murder. Due to the lack of resources that American detectives are regularly granted access to, Korean detectives, it is claimed by the film’s protagonist, “detect with their feet” rather than brain. The lack of progress in the investigation thus results in a reinforced faith in folklore; the detectives try to better embrace their isolated surroundings as a reaction to their need for and dependence on American technology. In a typical turn to comedy, Bong has them begin to read tealeaves to try and reveal the face of the killer, and rely on their “shaman’s eyes” to find clues. In Okja, however, the locality is not posited as a space that is frustrated and dependent on exterior powers, but rather an Edenic paradise that seems to just exist, without disturbance from the outside - not unlike the environment created in My Neighbour Totoro (1988), for example. The essence of folklore is exemplified in the first image of Mija’s grandfather, which shows him carrying firewood on his back while holding one of the sticks as a staff to accommodate his uphill trekking. He later retrieves some water from a pump well, which is positioned in front of a steaming stove that overlooks the vastness of the surroundings. The time allotted to documenting these moments expresses a tenderness towards and validation of their quiet purity. The accomplishment of day-to-day activities through manual means, such as the preparing and eating of food, the gathering of supplies, or simply rambling through the greenery, establishes a visual language of honesty and authenticity that is largely without the aid of technology. With that being said, Bong does recognise this as something of an impossibility in the modern day, and rather comically equips the grandfather with a megaphone to summon Mija for dinner - not unlike the detectives in Memories of Murder congregating around the television eagerly to watch Inspector Chief. Nonetheless, the film takes great pains to establish a luxuriously pastoral narrative harmony, in order to accentuate the disturbance when representatives of a multi-national corporation show up unannounced. Indeed, the arrival of the first Mirando official (Dr Johnny, at this point, is still struggling behind) interrupts the grandfather’s chores, while he straight-away makes himself at home by opening his laptop - a rather unsubtle Leo Marxian machine in the proverbial garden. Once Okja is taken away, the complete prohibition on movement - which she is so used to freely enjoying - is signified by the film’s visual establishing of the new location. We cut to an aerial long shot that contains Mija in the daily struggle of getting past New Yorkers on an overwhelmingly packed flight of stairs. It is immediately clear that she will suffer in this environment, rather simply because she is too big for it, and, more tragically, too playful. The images of the illustrious pig struggling to stay upright and shrieking for help in the back of a van, or trundling to safety through a department store and leaving destruction and damage in her wake, provoke a longing for the earlier adventures in the boundless countryside, which seem increasingly further away as the madness escalates. Her capturing and subsequent torture necessarily put her (and Mija’s, to a large extent) duty as a central figure on hold; her narrative is now halted and governed by the muddled politics of contemporary America, while the film turns its head towards the Animal Liberation Front. In much the same manner as he dealt with Curtis as a protagonist in Snowpiercer, the handling of the ALF, in particular its charismatic leader Jay (Paul Dano), conveys a scepticism towards conventional Hollywood heroism. From the outset, although the ALF are characterised as peaceful protesters and action-taking do-gooders, there is an emphasis on their own image and reception that evidently cannot be shaken. Their introduction leans dangerously towards self-consciousness and irony, as they scatter flower petals over the company van to signify their sworn allegiance to nature, as if desperate to warrant the appellation of ‘hippies’. The score - a strangely upbeat and somewhat dizzying trumpet arrangement - codes their mission as both fun and somehow regular, as if they pull off elaborate stunts to save animals on a weekly basis. When Jay shakes the can of spray paint, it clicks in time with the music, as if to colour them as more energetic and authentically engaging in an urban world of grey. When riot guards are called onto the scene, the ALF brandish umbrellas in their defence - a moving image of antiquity and quaintness, though rather transparently constructed. In these instances, we are gradually invited to question the integrity of characters whom otherwise would usually be considered wholesome and compassionate. Their first proclamation “we don’t like violence, we don’t want to hurt you” happens to precede them driving a van into the Mirando vehicle (onto which Mija is still desperately hanging) and forces a dangerous halt in a civilian-ridden tunnel. After the commotion, and once their objective of retrieving Okja is met, they introduce themselves formally to Mija. However, no sooner do they reunite a young girl with her best friend than turn their attentions to an even more elaborate stunt. The proposition to allow Okja to be recaptured with a hidden camera attached to her body, in order to capture footage of her inevitable torture and mistreatment, is one categorically determined by image-making. For a group that largely identify themselves as anti-corporate and allies of the oppressed, many of their methods appear to have their cues taken from those they supposedly wish to bring down. For example, Mija overtly rejects their proposition, and yet K (Stephen Yeun), the Korean translator, exploits the language barrier (and thus Mija’s locality) by lying about her permission being granted. This exploitation stems primarily from a perception of Mija as an easy target, a conquerable “other”, in sociological terms. It is not unlike Curtis taking for granted that the two Korean characters in Snowpiercer will help him on his quest, which does not benefit them in the slightest, without reservation. The ALF’s treatment thereby mirrors the more exaggerated exploitation undertaken by the Mirando Corporation when they attempt to stage a reunion between Okja and her owner, whom they insist must wear a kimono. The positioning of Jay as the narrative’s peaceful saviour is also thoroughly undermined by his brutal dispensing of K, when he confesses his earlier manipulation of Mija. He is not only dismissed from the ALF, but also beaten to within an inch of his life. It is a classical display of authority, and unquestionable power - traits one would not normally associate with an animal rights group. Further, when removing his bellboy disguise before the mission’s climax in the Mirando street parade, the film briefly grants him a low angle tracking shot, until he is striding forward in his suit, which plays into his own personal image-making and endorses his desire to be not only respected but known. In short: the good deed is simply not enough, and requires validation through recognition, which they eventually achieve through the distribution of footage on Youtube that damages the image of the Mirando Corporation. Just as Curtis, in Snowpiercer, was revealed in the end to be ideologically flawed, and contributing to the same cycle of unequal power distribution, here the ALF are firstly signposted as heroic and antithetic to the inauthenticity of Mirando, but gradually reveal as much egotism and obsession with image-making, virality, and status as those they claim to hate so much. In the end, it is only Okja and Mija’s friendship that remains authentic and uncorrupted. As with Snowpiercer’s final shot of a boot in the snow, Okja closes on an image of rebirth, and optimism. After the trauma they suffer, Mija and Okja (along with the newborn piglet they managed to rescue) are allowed a retreat into the tranquillity of that initially utopic local space. The final shot frames Mija and her grandfather sitting for a meal, lit by the sun from the open door, while the piglet scuttles in to offer the gift of a fruit. The grandfather quietly acknowledges the gesture, and sees that all is well. The stillness of the image suddenly invites a focus on the sound design, which incorporates the cackling of the chickens, the glimmer of nearby bugs, the deep, contented breathing of Okja, the scampering of the mischievous new-born, and the crunch of a vegetable being eaten. When the film cuts to black, the melodies of birdsong accompany the end credits score. An emphasis is placed on the serenity of solitude, on the glorious isolation of untouched locality. The notion of rebirth is not the only commonality between Okja and Snowpiercer’s endings: both conclude with a Korean character neglecting to engage with the hypocrisy of globalised entities. After discovering the inability to distinguish between the alleged “heroes” and their oppressive superpowers, Mija firmly opts to retire from the manipulation of corporate cartoons and champagne activism. Exhausted by their artifice and preoccupation with image construction, she returns to what she knows to be truly authentic: a local space. This Alternate Take was published on April 14, 2018.